James Hardie® fiber cement siding products are installed on over 5.5 million homes from coast to coast, designed to resist the most extreme conditions while romancing the senses. Enjoy the warm, natural character of wood with unprecedented peace of mind. It’s easy to see what makes James Hardie the market leader. Only James Hardie fiber cement products are Engineered for Climate. ® In the northern U.S. and Canada, HZ5® products are specifically designed to resist damage from wet or freezing conditions. Engineered for the southern, southwestern and Pacific coastal regions of the U.S., HZ10® products help protect homes from hot, humid conditions, blistering sun and more. 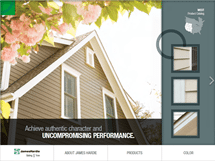 With James Hardie siding and trim, homeowners have an exterior that’s tougher than the elements and easy on the eyes.